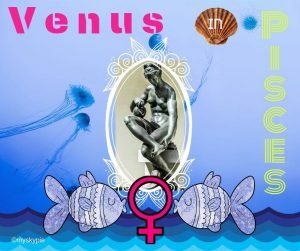 On the 26th of March, Venus, the planet of love, romance, harmony and values, glides in to the sign of Pisces, the sign of its exaltation, ruled by Jupiter (traditional) and Neptune (modern). Although the Sun has just left Pisces we still have Mercury, Neptune and now Venus there. However, until the 31st, when Mars enters Gemini, we will have a lack of the Air element in the skies which means that seeing the big picture and planning ahead could be difficult. So we may be lost in a realm of fantasy, washed over by feelings of love and happiness, dreaming of a lottery win, happy in the company of all and capable of seducing all, not really in tune with reality and with our thoughts tending towards muddled and fuzzy with Mercury stationing direct bang on Neptune on the 28th! 10th April: conjunct Neptune at 17°24’, dreams really could be too good to be true let’s use the applying sextile to Saturn on the 13th ( 20°16’) and Pluto on the 14th (23°07’) to ground us without too much obsession for what might never be. 16th April: the square to retrograde Jupiter at 24°18’ could beckon us to go comfort shopping but being retrograde we should ask ourselves if over-spending is the right solution!